Tree Ring Symbology uses a series of ring symbols, chronologically increasing in size like the growth rings of a tree. Color and/or thickness then encode some data variable. 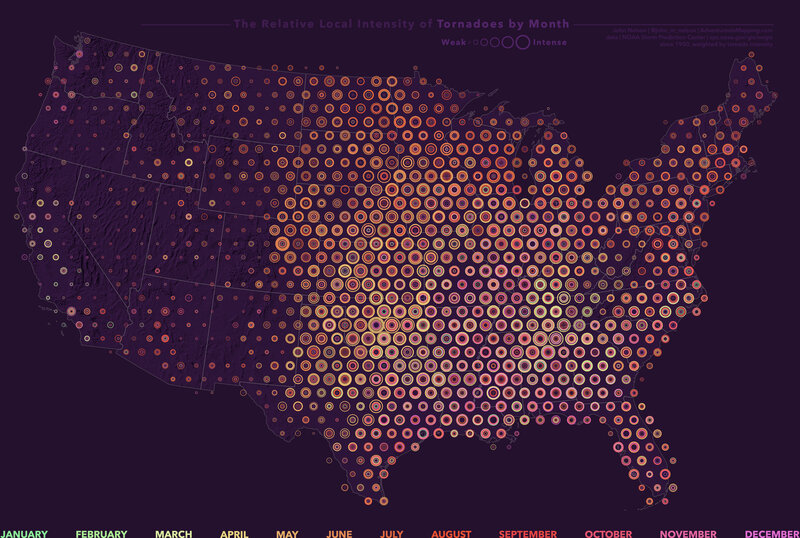 This map uses a variant, where instead of scaling the rings chronologically, like a tree, they are scaled by local aggregated tornado intensity, while the colors indicate time (months). This is a wholly impractical map with far too many rings at each location. But still, there is something intriguing about it. It sort of reminds me of a Chuck Close painting (of which I recently got to see my first actual, at the National Portrait Gallery). The fonts, and the muted colors, are inspired by Wes Anderson, a big-time favorite of mine. I’m fairly certain, though, that it is not very accommodating to those with color-deficient vision. And I do regret that. Anyway, sometimes maps don’t have to be entirely practical. This map gives me ideas for other (more sensible) maps, which is its own gift. But mostly, I just like looking at it and challenging myself to mentally encode the month colors to see if I can, with effort, tease out regional trends. Isn’t that weird? Relatedly, in school I did usability testing of mapping interfaces. I found, by accident, that the most tedious (lots of clicks and lots of time) interface structures consistently resulted in people remembering the content better. Effort helped to cement the memory. My working bias was that fast and simple was wholly better. And it probably usually is. I make a living at creating things (whether they are visualizations or software user experiences) that are supposed to communicate easily and efficiently; facilitating a person’s ability to intuit. I frequently think about the trade-off of information that may be too-easily processed. Will it its ease of acquisition make less of an impression? Will it catch the eye but fail to engage in a lasting sense? Is it worth it? Is there a way to embed within a design some amount of required effort without aggression or alienation? Am I just rationalizing? What is the best way to honor the audience? I don’t know.